What government executives, managers, and staff need to know to better leverage your organization’s data by managing less of it, increasing the quality of what remains, and making that data more shareable. 1) Without an agreed upon definition of big data all results (measurements, claims of success, quantifications) were correctly viewed skeptically and with suspicion! 3) These projects were implemented as technology-first initiatives. 1) Data science initiatives has not been productive enough. Big data project failure rates aside, all data scientists will describe their jobs as frustrating because they spend 80% of their time munging their data so that they can spend the remaining 20% of their time analyzing it. 2) Current curricula do not instill enough interest/skills in these graduates 'learning the business.' As a result, these professionals tend to be more allied with their methods than they are to their organization and its mission. 3) Their skillsets are too generalized and initiatives typically require a three-year learning curve before selection of various approaches are considered fruitful and productive. 3. Eliminating the Seven Deadly Data Sins. Accomplishing these will show you how to recognize opportunities, 'size up' required investments, and properly supervise efforts to properly leverage your data. Collaborate effectively about data among data, IT and business professionals. Address the fundamental challenges that come from implementing data-centric practices in your organization. Understand the shared challenges among Federal Government data leaders. Create effective success factors for managing your data initiatives. Develop required organizational skillsets for implementing your data initiatives. Communicate effectively what data success looks like from various organizational points of view in order to achieve a unified perspective. Eliminate the seven deadly data sins. Prepare your organization to meaningfully understand the state of our collective profession and prepare for achievable success. This Workshop provides latest thinking around data that requires a different (updated) perspective that has been offered in the past. Data-centric organizational practices can be more usefully defined in objective terms permitting easier implementation. Key to data success is to first refine, then improve/share. Learn to express data goals timeframes is ways that get folks thinking in terms of decades but in ways that can show periodic deliverables. Very little of this material is incorporated into formal education programs. Government officials embarking on either IT or business improvement related initiatives – data, after all, is at the heart of all of these. Industry and Consultants supporting government clients. Jon Minkoff, CDO, Enforcement Bureau, Federal Communications Commission. Includes table topic discussion. Designated table leaders will "report out" after lunch. Government Leadership Keynote: What has to go correctly in order to succeed at data leadership! Team Rate Send a team to learn together. Register two employees from the same office at the same time and the third person onwards registers at $200 off of the current rate. Daniel Morgan is the first Chief Data Officer of the United States Department of Transportation. As the CDO, he has overall responsibility for the Departmental data program and data compliance across the Department. He is responsible for establishing a clear vision of the data managed in DOT and the application of DOT data for decision-making. He serves as data strategist and adviser, steward for improving data quality, liaison for data sharing and developer of new data products. Mr. Morgan holds a Bachelor's Degree in Mechanical Engineering from the University of Illinois at Urbana-Champaign. · In 2010, promoted to serve as the first Chief Data Officer of the FCC’s Enforcement Bureau. · In 2016, served as the FCC’s representative to the White House OSTP Data Cabinet. · Since 2014, served as a member of the FCC’s data management steering group. · Currently a member of the Governing Body for the Washington D.C. Chief Data Officer Executive Summit, which a group of the top 100 enterprise and federal organizations in the DC area. · Prior to being promoted to the Enforcement Bureau’s CDO, served as the legal advisor to Bureau Chief, providing legal and technical analysis in cases about wireless, wireless, broadcast, and public safety matters. · Before joining the Enforcement Bureau in 2005, worked in the FCC’s Wireline Competition Bureau as a senior attorney involved in merger and anti-trust matters, as well as various rulemakings. Peter Aiken is consistently named as one of the top ten data management thought leaders. He is an Associate Professor with Virginia Commonwealth University's Department of Information Systems and is the Founding Director of Data Blueprint. Dr. Aiken previously held the position of Computer Scientist with Office of the CIO of the US Defense Information Systems Agency. He has consulted with organizations in dozens of countries helping them to do more with their data. Data problems are one of the key issues facing organizations as the pace of international commerce and cooperation increase around the world. Various initiatives from outsourcing, to "extreme" systems development, to business engineering increasingly rely on good quality data exchanges. Dr. Aiken's research methods, associates, and projects increase the effectiveness with which data assets are focused in support of organizational strategy. He has authored or co-authored eight books and many other publications. Dr. Aiken's achievements have resulted in recognition as one of 2000 Outstanding Intellectuals of the 21st Century and bibliographic entries in Who's Who in Science and Engineering, Who's Who in American Education and other biographical compilations. He is the recipient of multiple International Awards. His electronic addresses are peter@datablueprint.com and http://peteraiken.net. Mr. Kevin Garrison serves as a Research Staff Member in the IT Studies Division of the Institute for Defense Analyses where he conducts research and analysis on a wide range of IT issues, including system analysis, IT cost modeling, cybersecurity, and machine learning and natural language processing. Prior to this, he was Chief of Analytics in the Office of the Department of Defense Chief Information Officer. With more than 40 years combined Federal Service and defense contractor experience, Mr. Garrison led efforts that built a DoD enterprise business data analytical environment and engaged with key stakeholders across the Department to identify IT systems and provided analysis for cost saving opportunities. His leadership drove an informed decision-making model based on a repeatable data analysis methodology, including processes for data collection and enrichment, IT spending segmentation, and industry benchmarking comparisons. Prior to this assignment, Mr. Garrison served as the Department of Defense (DoD) Principal Director, Deputy Chief Information Officer for Business Process and Systems Review (DCIO(BPSR)). The organization’s function was to conduct business process and Information Technology (IT) systems reviews directed by the Deputy Secretary of Defense in July 2014. Prior to that, he served as the Deputy Director of Information Enterprise Governance with a portfolio including Office of Management and Budget (OMB) initiatives, IT Portfolio and Inventory Management, and Acquisition Oversight. He was the lead action officer for PortfolioStat, TechStat, Shared Service, and CIO Ratings on the Federal IT Dashboard. As the requirements manager for the Department’s IT systems inventory, he implemented several initiatives that provided greatly improved visibility for technical and financial matters related to IT. 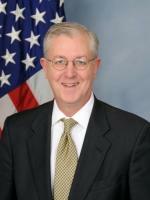 Mr. Garrison was also responsible for significant activities regarding Defense Business Systems, including development of the IT portion of the Strategic Management Plan, the Enterprise IT Infrastructure Functional Strategy, and improvements to policy guidance to refine granularity in identifying IT systems performing business functions. Mr. Garrison spent 12 years as a defense contractor supporting the Assistant Secretary of Defense (ASD) for Command, Control, Communications, and Intelligence, ASD (Networks and Information Integration), Army CIO/G6, Army G3 LANDWARNET, Wounded Warrior, and the Federal Voting Assistance Program. He supported the Year 2000 Program Office and managed reporting to OMB, GAO, and DODIG, as well as distribution of the $2.2B supplemental appropriation. He later supported the development and management of the DoD IT Portfolio Repository, IT Portfolio Management, and FISMA E-Gov, and Privacy Impact Assessment reporting. In the Army CIO/G6 he managed the Army Knowledge Management Goal 1 Waiver process and improvements to the Army Portfolio Management System. In Army G3/LANDWARNET he drove implementation of the initial Capability Portfolio Reviews for IT. Mr. Garrison is a retired US Army officer and a graduate of the US Air Force Academy (BS Astronautical Engineisering). He also Acquisition Certified at Level III for IT and Level I for Program Management, and is a member of IEEE and ACM. Linda Powell is the Chief Data Officer of the Consumer Financial Protection Bureau. Previously, she was the CDO at the Office of Financial Research with in the U.S Treasury Department and Chief of the Economic Data Management and Analysis section in the Research Division at the Board of Governors Federal Reserve System. She has a BA in Economics from Rutgers University and an MS in Finance from George Washington University. She has over 25 years of experience in the finance industry including a money center bank, the Federal Reserve Bank of NY, the Board of Governors, the OFR, and CFPB. Todd Harbour is the Chief Technical Officer (CTO) Broad Creek, LLC. Prior to this, Todd was the Chief Data Officer (CDO) for New York State, where he orchestrated work to design and implement a data management regime for the Empire State. Todd’s work included developing a data governance strategy, framework, and roadmap, defining a unified information architecture, realizing master data, coordinating data sharing, and establish a state-wide data analytics community of practice. Todd was also a senior federal government official based in the Washington DC metropolitan area, where he led work to establish data strategies, business frameworks, and data management platforms, which helped provide a reliable basis for answering questions from Congress and organizational leaders. Previously, Todd served as senior vice president at FGM Inc., a software and systems engineering corporation in Northern Virginia.